There's one massive testosterone suppressing issue that haunts men globally - and it often goes completely unnoticed. I'm talking about micronutrient (vitamin and mineral) deficiencies. What micronutrient deficiencies can more than halve serum T.
Supplementation with what vitamin can increase testosterone by 25%. 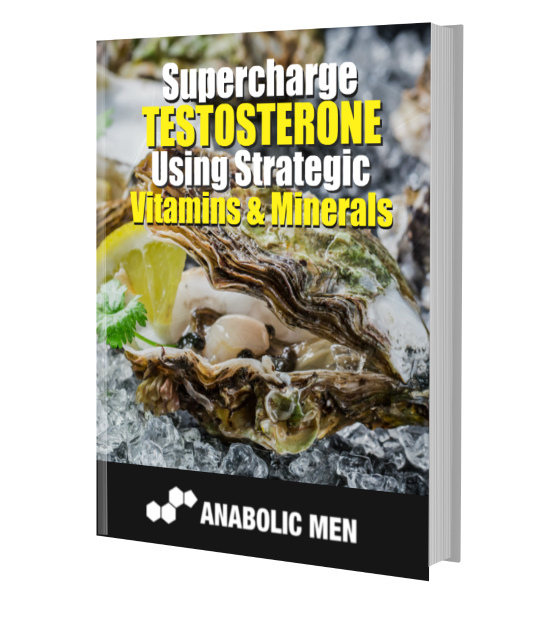 How another fat-soluble vitamin can lead to 27-60% higher testosterone levels. What unpopular trace mineral reliably increases free-testosterone by 29%. What mineral everyone claims is "healthy" but it really suppresses testosterone production. As a bonus gift, you will also receive an exclusive 20% off coupon that is applicable to ALL courses on the Anabolic Academy. Simply sign up using the box below, you will then receive a confirmation email, confirm using a link in the email and the ebook will be instantly delivered to your inbox. Our mailing list is 100% free and contains no spam. You can unsubscribe anytime with a click of a link.